Please do donate your rubber and brake dust to AMP. 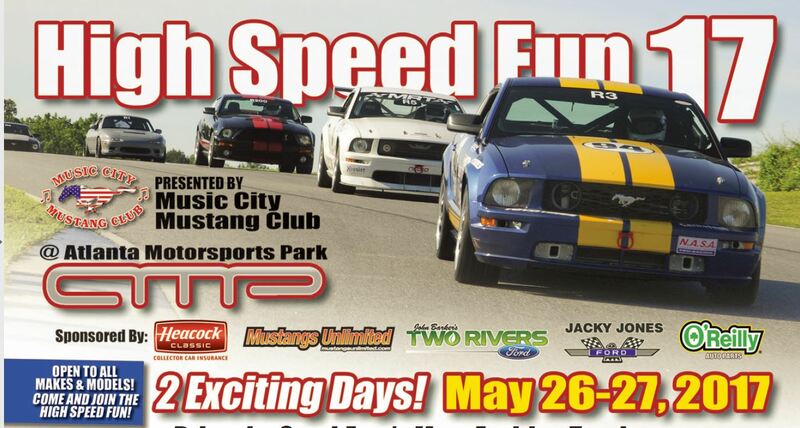 The Music City Mustang Club has invited us again to join them at Atlanta Motorsports Park on the last Friday and/or Saturday in May and check out their HiSPEED Playground. If you are interested in a true road course where it is safe to learn with drivers of like skills OR the chance to run with the big dogs, if you wish, this is your chance. Keep in mind there is no “racing” involved and passing is allowed only under strict controlled conditions. It’s your chance to learn to drive fast safely, with qualified driving instructors available. The ATLANTA MOTORSPORTS PARK , a road course, located near Dawsonville GA, is a road course designed by famed Formula One architect, Hermann Tilke. AMP is the first green, sustainable motorsports facility and country club of its kind. Instead of the typical country club with a golf course at its center, at AMPs heart is a 2-mile road course (with a 100′ elevation change) technical course layout, 100MPH straights and two ‘signature’ corners designed to pay homage to famed European race-courses. They also have a companion Kart Course available with a 43 ‘ elevation change. For any MCMC member interested in participating on either, or both, days at AMP in May, you will need to follow thru on your own, as this is not an officially sponsored Music City Miata Club event. Whether you’ve run a course like this before, or not, we promise you’ll return home with memories of the adrenalin high and your personal growth as a safe, fast Miata driver.